Most of us like to start the new year off with new resolutions. If eating better is one of your goals for 2012, here are 12 foods that we think deserve another try or a more starring role at your table. Some may be new to your palate, while others may simply have been overlooked. Why? As far as dark green leafy vegetables go, kale is a well-rounded winner with many nutrients. In particular, it has high levels of lutein, a nutrient important in eye health (seven times the amount found in spinach), as well as excellent levels of Vitamins A and K. It also contains Vitamin C and fiber. How? Kale chips are quickly gaining in popularity. Finely chopped kale can also be added to salads, stir-fries, fillings for salad or spring rolls, omelets, frittatas, casseroles, or pasta dishes. ​Why? ​Nutritionally speaking, sardines are an excellent source of the omega-3 fatty acids EPA and DHA, Vitamin D, and Vitamin B12. Both the omega-3 fatty acids and Vitamin B12 play important roles in cardiovascular health, and Vitamin D is a crucial nutrient in bone health. From an environmental point of view, Pacific sardines sit on the Super Green List from the Monterey Bay Aquarium, meaning they are low in contaminants (mercury and PCB), contain at least 250 mg of both EPA and DHA per serving, and are a Seafood Watch Best Choice (green category). ​How? ​Sardines are rarely available fresh because they are highly perishable. Fresh sardines can be grilled whole and enjoyed with a squeeze of lemon juice. To eat canned sardines, add them to meatballs, meat patties, or pasta dishes (try them in puttanesca sauce), or simply use chopped sardines as a pizza topping. ​Why? ​North Americans consume large amounts of wheat flour, which is made from wheat berries. Think of wheat berries as the least processed form of wheat you can possibly get. As whole grains, they are high in fiber, and provide manganese, selenium (important in antioxidant reactions), magnesium (important in blood pressure regulation and diabetes prevention) and phosphorus. They also contain lignans, which appear to be protective against breast and prostate cancers. How? Cooked wheat berries are great in salads, soups, or even as a hot breakfast option. Add them to bread dough, muffin batter, or to meat(less) patties. Why? Sunflower seed butter, like SunButter, is a nut-free alternative to peanut butter. Sunflower seeds are rich in polyunsaturated fatty acids and an excellent source of Vitamin E, the fat-soluble antioxidant that plays an important role in cardiovascular health and mitigation of inflammation in arthritis. Their phytosterols have cholesterol-lowering properties. They are also high in magnesium, manganese, and selenium. How? Use it as a peanut butter substitute in recipes, whether for baking or cooking. It also works great as a nut-free base for pesto. Why? Collectively, sea vegetables or seaweed are very low in calories, high in fiber, and fat-free. They contain high levels of the mineral iodine as well as substances called sulfated polysaccharides, which have strong antioxidant and antibacterial properties. Some species have even been shown to be high in the heart-friendly omega-3 fatty acid EPA, which is mostly found in fish. Some species of sea vegetable are good sources of calcium, iron, and magnesium. How? Generally sea vegetables do not require cooking and can be consumed after a brief soaking. Add them to stir-fries, salads, or soups, or use them in place of noodles. Why? Soy is good for you because of its high content of polyunsaturated fatty acids, fiber, and isoflavones. 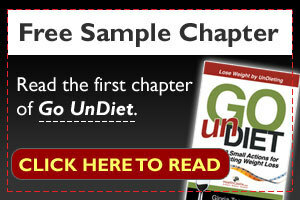 But in her book, Gloria Tsang lists “un-soy-erize” as one of 50 Go UnDiet Actions – because not all soy foods are created equal. Real soy products include tofu, soy nuts, edamame, and some brands of soy milk. Skip soy patties or wieners, and any products containing soy protein isolates, soy protein concentrates, or textured soy protein. How? ​Use silken soy in smoothies. If you aren’t sure how to cook plain tofu, try dessert tofu. Why? As far as legumes go, lentils are tiny yet mighty. Their smaller size makes them cook faster than other types of dried beans, and they are rich in fiber (both soluble and insoluble). The fiber in lentils has beneficial cholesterol-lowering effects, and also helps stabilize blood sugar levels. In addition, lentils are a source of folate, manganese, and iron. They are rich in protein yet very low in fat. How? ​Lentils do not have to be presoaked like dried beans. Red lentils have a milder flavor and take slightly less time to cook (20 minutes) than green lentils (30 minutes). Use lentils in soups, salads, casseroles, or patties. ​Why? Nowadays, buying yogurt at the store often means perusing a mind-boggling variety of products with various health claims. So, when it comes to yogurt, get back to basics. Yogurt is essentially milk that has been fermented through the addition of bacterial cultures. Choose yogurt that actually contains active bacterial cultures. (The most common strains are L.bulgaricus and S.thermophilus, which have been shown to reduce lactose intolerance and help treat diarrhea. Another strain, L.casei, has been shown to help support the immune system.) Besides supplying beneficial microflora, yogurt is an excellent source of protein and calcium. How? ​Buy plain yogurt for making smoothies, baking, or making your own dip. For sweetness, sprinkle in dried fruit or brown sugar, or use a drizzle of honey. Check the ingredient list and avoid products with too much sugar or additives such as coloring and artificial sweetener or flavors. ​Why? ​A species of fish originally from Australia, barramundi is now available domestically as a farmed product. One of its unusual features is that, although it is a white fish, it has high levels of omega-3 fatty acids, comparable to those of salmon. Fresh, U.S.-farmed barramundi is rated as a Best Choice by the Monterey Bay Aquarium. How? ​Barramundi has a mild taste that lends itself to many preparations. Try it baked, grilled, or pan-fried. Why? This vegetable, despite the name, is not related to artichoke. It is the tuber or root of a sunflower species that is rich in inulin. Inulin is a prebiotic, which gets broken down by bacteria in the digestive system to form short-chain fatty acids shown to be protective against colon cancer. ​How? ​Enjoy sunchoke raw or cooked. When raw, the texture is similar to jicama, so enjoy it in a salad or with a dip. When baked or boiled, sunchoke develops a starchy texture similar to potato, with a hint of sweetness. ​​Why? Enoki mushrooms have been shown to have anti-cancer and immune-boosting properties. They have thin, slender stems and tiny caps and grow “bunched” together at the base. ​How? ​Cut off the bottom base and you will have slender stems of mushroom to eat raw in a salad, or add to soups or noodle dishes (put them in towards the end of the cooking time since they cook very quickly). Why? Black rice is rich in anthocyanin, the same antioxidant found in fruits like blueberries, as well as Vitamin E. As a whole grain, it is also high in fiber. ​How? ​Use where you normally would with white rice, such as salads, pilafs or dessert. Black rice will take longer to cook and turns a dark purple color when done.